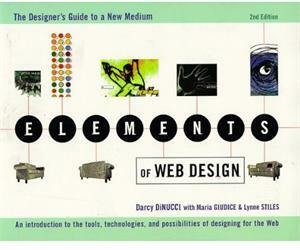 Elements of Web Design is written for people who know design but just don't know the Web. It describes how your skills can be applied to the exciting world of Web design and introduces the terms, tricks, and technologies you'll need to know to get started. When you're done, you'll have a grasp of every element of Web design, from assembling your team through planning your pages and publishing your site online. The second edition of this acclaimed, visually stunning book has even more examples of some of the best Web sites created. Designers from nine Web design companies share their design secrets and experiences, and illustrations from hundreds of sites show examples of the design principles at work, all in full colour. Unique to Elements of Web Design is its focus on planning and preparing a site before work begins — what the authors call "page architecture". After a site's goals, functions, and content are defined, the book shows how to integrate them all into a compelling and attractive Web site. There's also plenty of solid advice on the nitty gritty of Web page design. Topics such as typography, animation, image maps, 3D graphics, SGML, formatting and preparing graphics, HTML basics, animation, interactivity, and keeping a Web site fresh are explored. Darcy DiNucci has written about design and technology for over 15 years, as an editor for PC World, NeXTworld, and Publish magazines.